We've used and recommended Ideum's all-in-one touch tables a few times and have been happy with their performance as well as the customer service from the company. Some of the Ideum team were in our neighborhood recently so we invited them to the studio to catch up on what we were all up to, but the highlight of that visit was that they left us with some new toys to play with. 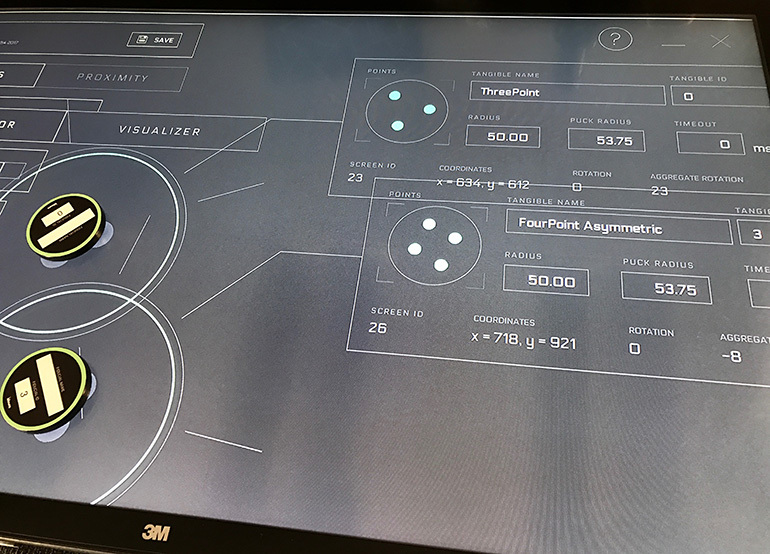 Their new Tangible Engine SDK works closely with 3M touch screens to track the position and orientation of specially-designed, 3D-printable objects as they move across the surface of the display. Tracking of specially-marked objects on touch screens has been possible before with bulkier vision-based systems like our beloved Surface v1 and the Multitaction cells, but not as much with slimmer pro-cap screens. These markers can be attached to things like drink coasters, artifacts, toys, and all manner of devices to bring a tactile aspect to a touch-screen interaction. The SDK includes a graphical tool to calibrate the system for your particular objects on your particular screen, C++ bindings for use in various application frameworks, and a package for integration with Unity. The API is quite simple, you just register for "tangible" events, which provide the ID, position, and orientation of the objects as they move around. We'll be exploring the toolkit in more depth soon, and are hoping to use it in future horizontal interactive experiences. If this sounds like the sort of feature you're looking for on your project, let's talk about bringing it to life.